Here's another Campbell's Soup recipe that's sort of along the same lines as the famous Green Bean Casserole. It's warm and comforting and always hits the spot. Maybe try this one instead of the green beans next time! 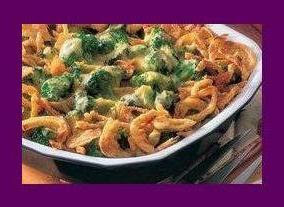 MIX soup, milk, black pepper, broccoli and 2/3 cup onions in 1 1/2-qt. casserole. BAKE at 350°F. for 25 min. or until hot. Stir. TOP with remaining onions. Bake 5 min. or until onions are golden.